Follow along for a live recap of the first finals session of the 2018 Sette Colli Trophy in Rome, Italy. For a recap of the first preliminary session, click here. Reigning world champion Etiene Medeiros of Brazil opened the finals session with a win in the women’s 50 back, dropping her season-best by over a tenth in 27.87. She improves her 27.98 from the Brazil Open, and jumps from 16th to 14th in the world rankings for the 2017-18 season. Denmark’s Mie Nielsen and Great Britain’s Georgia Davies were also sub-28, but both have been a bit faster this year (both 27.7) as they sit t-8th and 10th in the world respectively. In 4th, Silvia Scalia of Italy broke the Italian Record in 28.01, dropping Elena Gemo‘s 28.07 from 2015. Romanian Robert Glinta, who is coming off his freshman year with USC, defended his top seed to claim the men’s 50 back, putting up a new personal best time and Romanian Record of 24.78 (dropping his 24.97 from 2016). Brazilian Gabriel Fantoni, who swam his first season with Indiana this past year in the NCAA, cracked 25 seconds for the first time in his career for 2nd in 24.95, and Italians Matteo Milli and Simone Sabbioni were 3rd and 4th. Glinta is now 8th in the world, and Fantoni is 16th. 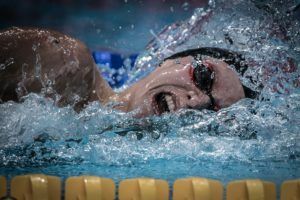 Great Britain’s Holly Hibbott sat back and tailed the leaders early on in the women’s 400 free, flipping 4th at the 200m mark, before charging home in a negative-split to overhaul everyone and snag the gold. Out in 2:05.19, Hibbott closed in 2:04.59 (including a 29.88 final 50), to win in 4:09.78. Currently, Hibbott ranks 7th in the world with her 4:05.31 from the Commonwealth Games. Belgium’s Valentine Dumont, who was the top seed coming out of prelims, held off the Italians behind her to take 2nd, posting a new Belgian Record of 4:11.12. That knocks off Isabelle Arnould‘s record from all the way back in 1988 of 4:11.71. Egypt’s Marwan El Kamash went out fast in the men’s 400 final, and led Ukrainian Mykhailo Romanchuk through 250 metres before the 2017 World Championship silver medalist in the mile took over. Romanchuk had a pair of 28-high splits to take the lead and then extended it coming home in 27.56 to touch in 3:48.04, improving his season-best of 3:48.68. El Kamash, who was 3:47.51 at the Mediterranean Games, touched 2nd in 3:49.40, with Italian Domenico Acerenza and German Poul Zellmann also cracking 3:50 for 3rd and 4th. Yuliya Efimova reclaimed her spot atop the world rankings in the women’s 100 breast, becoming the first woman sub-1:05 this year in 1:04.98. She passes Lilly King, had led with a 1:05.61, and also breaks Leisel Jones‘ 10-year-old meet record of 1:05.34. IM specialist Siobhan-Marie O’Connor took 2nd in 1:07.40, improving her season-best of 1:08.31, and Arianna Castiglioni of Italy and Rikke Moller Pedersen of Denmark were also sub-1:08 for 3rd and 4th. World record holder Adam Peaty blasted out to a big lead in the men’s 100 breast final, splitting 27.06 on the way out, and closed solidly in 31.55 to touch in 58.61, breaking his meet record of 58.72 set last year. He was also just .02 off his 58.59 from the Commonwealth Games, which is the fastest time in the world this year. Arno Kamminga of the Netherlands broke the Dutch national record this morning in 59.41, and dropped it all the way down to 59.14 tonight for silver, closing on Peaty with a scorching 31.31 back half. Coming into the day ranked 15th in the world, the 22-year-old now sits 4th. Fabio Scozzoli of Italy pleased the home crowd by cracking the minute barrier for 3rd in 59.89, holding off Great Britain’s 200 BR specialist James Wilby (1:00.01). 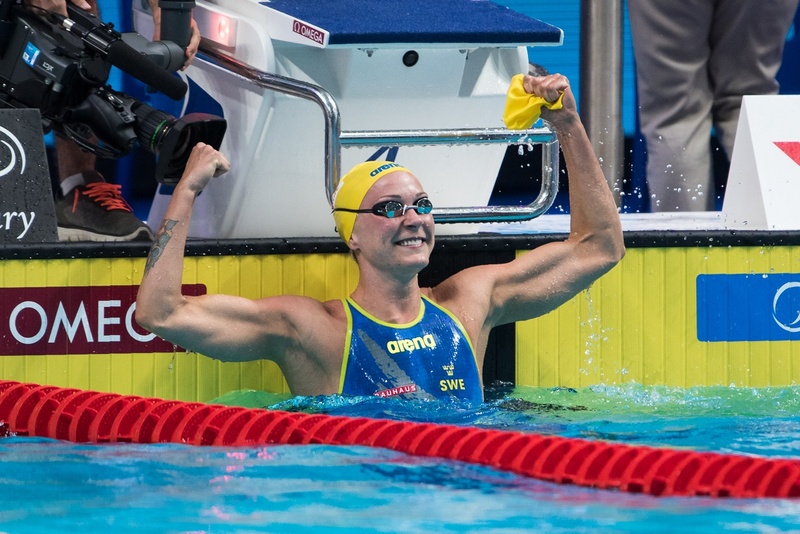 A meet record fell for a third consecutive event, with Sweden’s Sarah Sjostrom breaking her own 2015 mark of 25.23 in 25.19 to win the women’s 50 fly. Sjostrom currently ranks 1st in the world with her 25.07 done at the Luxembourg Euro Meet. Ranomi Kromowidjojo was the only other swimmer sub-26 for silver in 25.90, and Italian Elena Di Liddo edged out Belgian Kimberly Buys for 3rd, 26.13 to 26.19. For Di Liddo, that swim is a new personal best, and bumps her up into 15th in the world. Another meet record goes down as South African Chad Le Clos wins the men’s 100 fly in 51.24, over four tenths better than his record from last year. Le Clos currently leads the world rankings with his 50.65 from the Commonwealth Games. James Guy, the 2017 World Championship bronze medalist and the #3 ranked swimmer this year, had the fastest back half of anyone in the field in 27.20, and was two tenths back of Le Clos for 2nd in 51.44 (just off his 51.31 from Comm Games). Italian Federico Burdisso was also sub-52 in 51.73, lowering his Italian junior record that he set in the prelims. Also of note, 50 fly specialist Andriy Govorov went from 1st at the 50 (23.49) to 8th when all was said and done (52.98). 2016 Olympic champion Pernille Blume became the 2nd woman of 2018 to crack the 24-second barrier, doing it for the first time herself in 23.92. This breaks her Danish National Record of 24.00, and also knocks off her Sette Colli meet record from 2017 of 24.13. She moves past China’s Liu Xiang for 2nd in the world rankings, having previously been 3rd at 24.05, and is now behind only Cate Campbell of Australia (23.78). World record holder and reigning world champion Sarah Sjostrom touched 2nd in 24.18, one tenth off her season-best which is the 4th fastest in the world (24.08). She was fresh off the 50 fly, as was Ranomi Kromowidjojo who was 3rd in 24.64, and Kromowidjojo’s Dutch teammate Femke Heemskerk was 4th in a season-best 24.82. Ben Proud finishes the session off with an absolutely insane swim in the men’s 50 free, clocking in at 21.16 for a new Commonwealth and British Record. He takes down Australian Ashley Callus‘ Commonwealth mark of 21.19 from 2009, and cracks his own British Record of 21.30 from the Commonwealth Games in April. That swim previously was the fastest in the world this year until this 21.16 bomb. The swim makes Proud the 4th fastest performer of all-time, and .01 off Caeleb Dressel‘s textile world record of 21.15. It is also the 7th fastest performance in history. 2017 World Championship silver medalist Bruno Fratus of Brazil was 2nd, over six tenths back in 21.77, and Italian Andrea Vergani was 3rd in 22.21. Fratus currently ranks 2nd in the world, and Vergani 6th. Okay Lilly King 1:04.98 is what you have to go next weekend! Well, Adam Peaty is back: 58.61 (27.06/31.55). 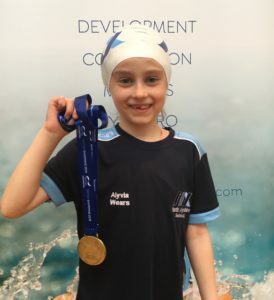 His fastest ever swim outside of a championship. Huge swim from Kamminga (59.14) in second. 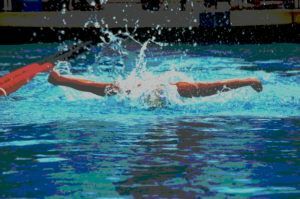 Over the moon to see SMOC rounding back into shape with a pretty sharp 100br. 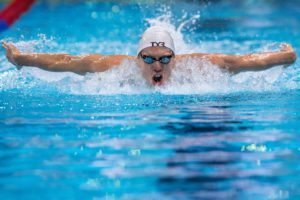 Who will have the fastest time in the 100 lcm breaststroke by the end of the summer? I’m putting my money on Adam Peaty, could be close though.